Yield Curve Inversion – What’s Different This Time? In 49 BCE a provincial governor named Julius Caesar and a single legion of troops crossed a small stream in northern Italy – the Rubicon River – sparking a civil war that led to Caesar’s reign and changed the course of history for Rome. Today, the phrase “Crossing the Rubicon” serves as a metaphor for taking irrevocable steps toward an outcome. In the financial markets, no indicator of an economic recession is as synonymous with the Rubicon as the slope of the yield curve crossing into negative territory. Historically, the yield curve has proved to be an accurate indicator of economic recessions. In the 1980s, early 1990s, early 2000s, and at the dawn of the Global Financial Crisis in 2006, the yield curve inverted in advance of a recession. What does the inversion signify and how does it contribute to the market outlook going into 2019? An inverted yield curve is a symptom of tightening monetary conditions from the Federal Reserve, which serves to slow credit, asset price, and economic growth – and typically results in a recession. The degree of the slowdown depends on the fragility of the underlying economic picture. The Fed has the difficult task of keeping conditions such that the economy grows at a sustainable rate, but not so fast as to produce asset bubbles. The additional factor of the unwind of Quantitative Easing, for the first time since the 1930s, adds to the degree of difficulty of this task. The markets are preparing for the end game of the current economic expansion. We expect a further period of higher volatility and low liquidity, absent additional public support through fiscal stimulus or markedly more accommodative policy from the Federal Reserve. Fed tightening typically involves raising short-term interest rates to the point where financial conditions become sufficiently tight to create economic headwinds and cast doubt on future growth. That doubt on future growth could manifest into a flatter yield curve and demand for longer-duration assets versus shorter-duration assets. 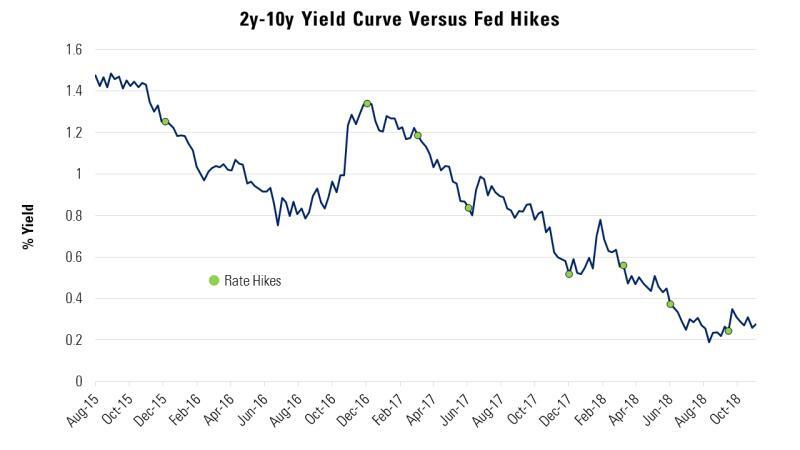 During the most recent Fed Cycle, the flattening of the yield curve has coincided with continued Fed hikes. In fact, Fed hiking cycles typically result in flatter curves. Looking back to Fed hiking cycles starting 1976, the chart below shows that Fed hiking cycles coincide with a decreased slope of the yield curve. Inverted yield curves don’t mean a recession is imminent. 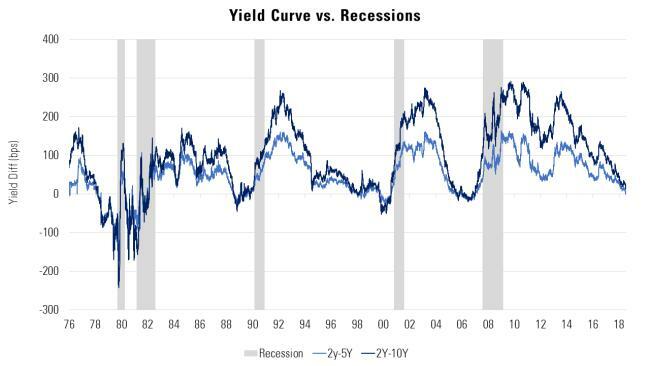 Going back to the mid-1970s, the average time from when the yield curve moves into negative territory to the start of a recession is 19 months. Source: Sage, Bloomberg What’s Different This Time? As the saying goes, “history doesn’t repeat itself, but it often rhymes,” the same goes for the business cycle. At the macro level, growth, inflation, and policy drive the evolution of the cycle, but there are often facets of those themes that are different. In the current cycle, one facet stands above all: the unwind of Quantitative Easing. In its effort to stimulate the economy when the Fed Funds Rate dropped to zero, the Fed instituted the asset purchase program, which ballooned the Fed’s balance sheet from $900 billion to $4.5 trillion. The purchase of financial assets resulted in a “portfolio rebalance” dynamic in which lower long-term interest rates forced investors to move out into riskier and riskier asset classes to earn the same yield. Volatility fell and remained low as investors were assured that the Fed would continue to buy bonds. The opposite dynamic is happening today. 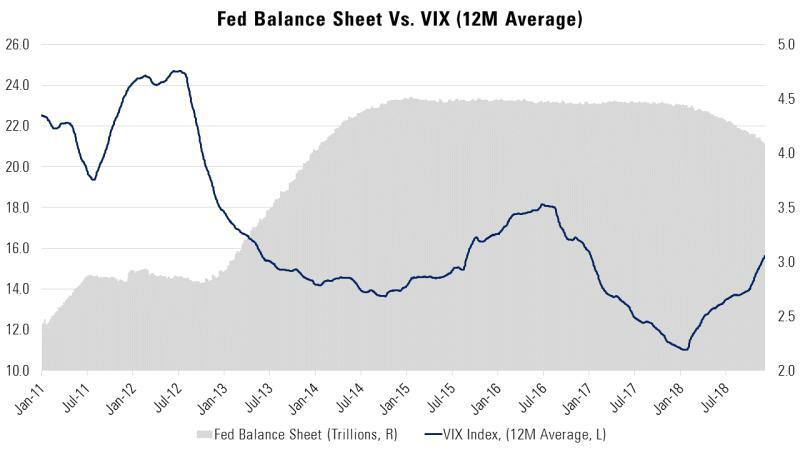 Tightening monetary policy now includes raising interest rates and shrinking the Fed balance sheet. The lack of buying has created a void in the marketplace, as investors rebalance into safer asset classes – cash becomes more attractive. Volatility has picked up, and as long as the Fed remains out of the markets, volatility is likely here to stay.